This second edition includes over 300 updates, a completely new numbering system, and a new format. Brian Stalker, compiler. Ross Gray, editor. 136 pages, 8.5x11, spiral bound. Colour C$ 47.00 [ISBN 978-1-927119-74-7]. This second edition of Travelling Post Office Postmarks Newfoundland & Labrador - A Study of the Postmark Hammers is a companion volume to Ross Gray’s Catalogue of Canadian Railway Cancellations (second edition, 2015). Being aware that Newfoundland and Labrador, with a much higher proportion of coastal mail steamer services, tended to be a discrete area of study, it was agreed that a separate catalogue would be produced. That also enabled more illustrations and hammer data to be included in the ‘Rest-of-Canada’ catalogue, while maintaining a manageable size. Consistency of style and format between the two catalogues has been achieved under Ross Gray’s editorship. The second edition incorporates around 300 updates reported during the twelve years since publication of the first edition. It has been completely reformatted using new listing numbers with railway postmarks numbered from NL-1 and coastal steamer postmarks numbered from NL-100, and with Ron McGuire’s assistance a new section has been added on the Newfoundland Post Office Assorting Office, North Sydney, Nova Scotia. Examples of almost all postmark hammer strikes are included and each section is preceded by a short résumé of general background information. 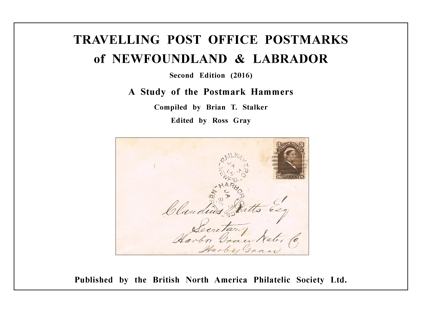 The Study of the Postmark Hammers is accompanied by a sister volume, Travelling Post Office Postmarks of Newfoundland & Labrador Compendium of Related Information . Brian Stalker, a retired electrical engineer, was introduced to Canadian Railway Post Office postmarks almost forty years ago and has been collecting, studying and exhibiting them ever since. Apart from building up a significant collection of Newfoundland and Labrador RPOs and TPOs, he also takes a keen interest in Canada’s Grand Trunk Railway and its constituent companies. Brian is a Fellow of the Canadian Philatelic Society of Great Britain and was inducted into the Order of the Beaver, the Fellowship of BNAPS, in 2015. He is also an active member of several philatelic societies within the United Kingdom.